Living in Aberdeen we are from Islay and Glasgow, and love spending time on the west coast when we can. Through Owner's Direct we offer weekly and short term holiday breaks at The Old Police House in Port Charlotte, Islay, offering holiday makers a comfortable place to stay in the west! We enjoy taking a hands on approach and try to ensure our guests have a good holiday stay, and we are happy to help with information and any specific information or requests. Port Charlotte is the prettiest village on Islay with a range of facilities within walking distance, but peacefully on the outskirts with tremendous views of the sea. Spend some time away from it all, but within easy walking distance of local facilities. People visit Islay and Port Charlotte in particular for the beautiful location in a conservation village, for the friendly people, access to beaches and hotels within easy walking distance, for various sources of entertainment and to enjoy the natural beauty of the village and island. Day trips to Colonsay, Oronsay and to Jura are possible, and the exploration of Islay's Distilleries provides much pleasure! Horse riding, fishing trips, bird-watching, swimming are just some of the activities we enjoy, in addition to breakfast in bed with a spectacular view of the sea and sky. The Old Police House has lots of living space, working fire, original Victorian features and stunning uninterrupted views over Lochindaal from the public rooms and two very spacious front bedrooms. As well as being light and airy in summer, it is warm in winter with the very efficient oil fired central heating. The front garden is enclosed, and the house is in a peaceful location only a short walk to the local beaches, shop and hotels and restaurants. Two shower rooms with modern tiling, shower cabinets with electric showers and multi light mirrors over wash-hand basins. Heated towel rail upstairs. Freshly laundered towels supplied throughout. The living room faces south over Lochindaal, and enjoys an open fire, with guard, ideal for peat or coal burning. Comfortable sofa and two bucket arm chairs. The large TV has freesat channels, and original artworks decorate the walls. Window shutters..
Notes on accommodation: The Old Police House was built as the exciseman's house for the former Lochindaal Distillery in Port Charlotte village. 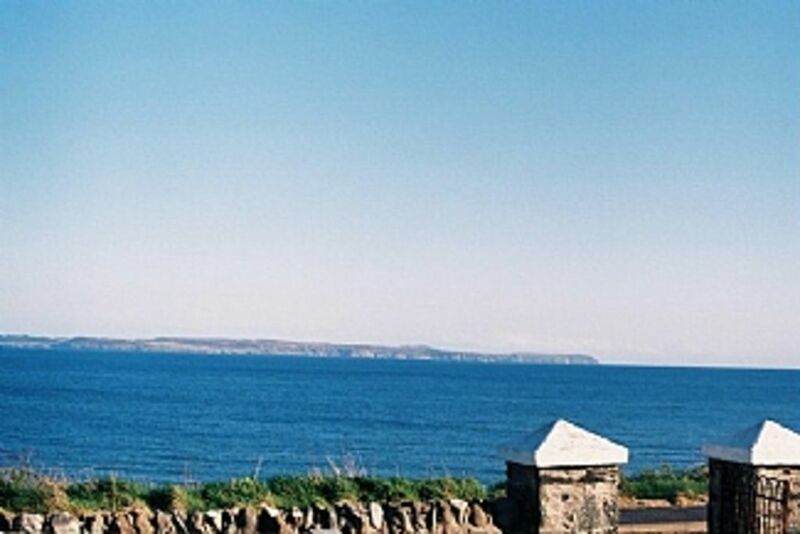 Built in 1890 it provides wonderful views of the Loch Indaal and over to the Antrim coast, and enjoys a quiet location on the edge of the village, within easy reach of local amenities. The spacious rooms with high ceilings and cornicing offer a happy base for our guests, who may wish to enjoy the island's peace, tranquility, wildlife, walking and many varied beaches, with beautiful views to the neighbouring islands of Jura, Oronsay, Colonsay and Mull. Wifi available. Travel cot and high chair available on request. Reception rooms spacious and well decorated, bedrooms spacious, furnished with simplicity. Main hallway with oak staircase has pretty striped carpeting. Neutral carpets throughout remaining house, with tiled floors in shower-rooms and kitchen. All main rooms have operating shutters, and cornicing, and neutral decor throughout. Outside: The rear garden is large and grassed, sloping up towards the rear dry stane dyke, with sunsets from the west. Look out for highland cattle in the field behind. The front walled garden is sunny, sheltered and overlooks the loch and faces south to Ireland. A garden bench is available in the front garden and folding outdoor chairs are also available in the utility for garden and picnic use. The garden locations are suitable for disposable barbecues. Two adult cycles are available in the garage. Storage available for guest cycles and other gear as needed. Utility Room: Freezer, washer drier, iron, ironing board, pegs and washing line, dyson vacuum cleaner, storage, fuel shed with peat, coal, furnacite for stove. External garage and further fuel and cycling storage. Cleaning / Towels / Linen / Maid service: Linen and towels freshly laundered included in price. Our local changeover lady ensures a clean and fresh environment. She and we are on call to provide support and advice. Beds made up for you on arrival, property fully prepared. Other: The dining room is sunny and warm, with controls for the cosy central heating system, LPG fire, dining room table which comfortably seats eight. Feature dining table and bench hand crafted in the Island, lovely sea views. Porch. We had a wonderful time here on Islay weather could of been kinder😄�Would love to come back again at some stage. The distilleries are interesting and well worth a tour. Thank you for your kind review - we’re so glad you enjoyed your stay and hope you’ll be able to return one day! A lovely warm house with a very nice welcoming feel to it.Situation very good for the Island. Visited the bar Port Charlotte Hotel in the village and felt very welcome. Had two meals there. Visited the Museum and found it very interesting talking to a local girl about the history. Visited the shop and shopped there. Very nice couple. Really liked Islay and our holiday home and hope to come back again. The Old Police House is spacious, well presented, well equipped and very clean. It is overlooking Loch Idall on the edge of the beautiful village of Port Charlotte. 6 friends and a very happy dog loved this house. Downstairs we found the kitchen/dining room eminently practical and very well supplied - even dishwasher tablets. It was well laid out so those cooking could chat to those planning the next-day trips at the dining table and we could all see the sea and the changing light all the time. We found the sitting room very comfortable after supper - one member of the group (non-cooking) was appointed peat monitor and after a few attempts made good, cosy fires which we needed even in August. There was plenty of peat supplied for our needs. The bedrooms were spacious and comfortable and with 2 bathrooms/showers we didn't have to queue. It was also really good to have a large sun porch on the front of the house for boots, maps, binocs, dog equipment and coats. The house is on the edge of Port Charlotte literally a stone's throw from the sea and there were always things to look at (though sadly we didn't spot the resident otter), good walks from the house and good pubs in the village. Especially enjoyed the fantastic seafood. Our hosts were generous and concerned to do all they could to ensure we had a comfortable holiday. All 7 of us would gladly return and cannot recommend the Old Police House too highly. Thank you for a wonderful week. Perfect property in a beautiful place. Four of us stayed in the Old Police House during our week on Islay. It was the perfect base for exploring the island. The house was very comfortable and exceptionally clean and well equipped. The views of the house do a good job of capturing the beauty of the location right on the loch. Several evenings we enjoyed a fire in the fireplace, but couldn't quite master the art of getting peat to burn! The are several nice places to eat close by, and everything on Islay is very accessible from here by car. The owners were most helpful and gracious. We are already dreaming of going back and would love to stay here again! Highly recommended. The property is situated on the coast, with two sheltered sandy beaches within walking distance, overlooked by a lighthouse, a small pier suitable for fishing, and a shoreline suitable for exploring rock pools. The sea loch of Lochindaal is regarded as safe for swimming, and the beaches in the village and at Port Ban, en route for Bruichladdich, offer suitable places for young children to play, under supervision. The wilder beaches on the west of the Island are good for walking and picnics. Islay Airport accessible from Glasgow is 30 minutes drive away, ferry terminals for Calmac Ferries also at 30 minute distances. Car hire companies and taxi services are available, with local bus services. Car hire/own car are recommended, due to rural location and access to the best visitor attractions. Day trips to Colonsay are possible on Wednesdays in summer, via Cal Mac ferry, and regular ferry services operate to Jura. The Old Police House is situated within the village of Port Charlotte, with the island being 25 miles from north to south. The main shopping village of Bowmore can be seen across the Loch, and is accessible within 15-20 minutes. The neighbouring islands of Jura, Oronsay and Colonsay are within day trip distance by ferry. Jura daily all year. Colonsay/Oronsay only on Wednesdays, and only in summer - please check with Cal Mac for times and booking recommendations. The local Post Office offers basic provisions, with further shopping opportunities at Bruichladdich and Bridgend. The main grocery stores are the Co Op stores in Bowmore and Port Ellen, whilst Bowmore is the main shopping village. The Wool Mill en route to Ballygrant is worth a visit, whilst the Square at Bridgend has a range of outlets of local wares. The distilleries throughout the island have visitor shops and tours available. Bird and sea life abound, with RSPB sites to visit, boat trips to hire, coastal and hill walking a real pleasure. A swimming pool is located in Bowmore, using heated water from the neighbouring distillery. Local Port Charlotte Hotel for good food and live music, Yan's kitchen for coffe, lunch and dinner, Lochindaal Hotel for seafood dinner. Further information is sent on booking, but the Islay info website provides a wealth of information for guests. Please do not hesitate to ask us for any specific information and advice! Booking Notes: Please contact owner, as these depend upon timing of bookings. We are happy to discuss individual arrangements, and access details and recommended activities are available on full payment. £100 per week non refundable deposit is required to secure a reservation. Full payment of the balance will be made at least eight weeks prior to holiday. Cancellation thereafter will result in refund only if re-booking is achieved, however every effort will be made to secure a replacement booking. Changeover Day: Saturday is the preferred changeover day, but we try to be flexible. Arrival is usually after 3pm, departure by 10 am. The house should be left as found, but all laundry is taken care of. Notes on prices: We are happy to consider shorter stay guests in the low season, prices to be agreed. Prices quoted include fresh linen, towels and utilities. Please note that the islay whisky week fees are available on request.